"Just wanted to say THANK YOU for partnering with us on the Downtown Safe Halloween event on Saturday! We couldn't have pulled it off without your help. Kids and families had a great time, and hopefully you did too! Thanks again for your hard work and I hope to see you next year." Like cheap boomerangs that never return, juggling balls often get abandoned in frustration. Mastering the basic three-ball cascade pattern is the key to unlocking the door to the world of juggling. Getting a grip on this essential skill is so vital that most jugglers remember the time, date and location when they first achieved it. Some people can learn to do the three-ball aerial rotation in a matter of minutes, while others can take a week or longer. A little advice and guidance from a teacher during the initial learning phrase can help a great deal. 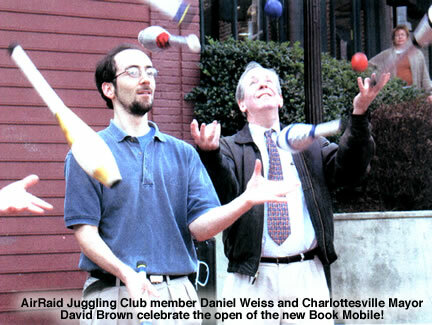 Charlottesville is blessed with one of the best, and perhaps most kicked-back, juggling clubs in the nation. One of the most accomplished members of the Air Raid Juggling Club is professional juggler and internationally renowned showman Mark Nizer. “I am so proud of the Charlottesville club, and I have been a member of some of the biggest and most active [juggling] clubs in the world, including the ones in New York City and Los Angeles,” said Nizer, who lives with his family in Albemarle County. “I am constantly inspired by the kids and adults in our club, and it really shows the great thing about juggling — that no matter how much you know, there is always more to learn and experience. The local club basically asks only two thing from its members — have fun, and teach others what you can. Its official mission is to spread the art of juggling throughout the area — but according to Philip Lewis, one of the club’s founding members, it’s even simpler than that. “Our mission is to help everyone who wants to learn how to juggle,” said Lewis, who has been juggling everything from balls to bowling pins for a quarter-century. “There’s no behind-the-curtain juggling secrets we keep to ourselves here. “If you want to learn how to juggle, we’ll help you, it’s as simple as that. Nobody should believe they can’t juggle, because we’ll take the time to teach you. The club has no entrance fee, dues or age limit. Some of its most accomplished members are teenagers. In head-to-head competition at the 2008 International Jugglers’ Association Festival and Championships held in July in Lexington, Ky., four of the club’s youngest members did remarkably well. Chris Hodge, 15, won both the four- and five-ball extreme juggling championships at the competition. This category requires contestants to perform the most difficult juggling trick they can manage within a minute. Chris also won the four-ball penguin contest. This trick requires him to juggle with his hands pointed outward as if they were flippers. He and his 13-year-old brother, Andrew, teamed up to take second place in the number ball passing championships by passing 12 balls between them for 93 catches. Not to be left out, their 8-year-old brother, Danny, won the five-ring juggling contest for participants younger than 15. What makes the accomplishments of the Nelson County brothers all the more remarkable is that they have been juggling for less than three years. “About two and a half years ago my dad gave Andrew a video of the International Jugglers’ Association Festival in 2005,” said Chris, who practices juggling three to four hours a day. “Watching the video we saw all the things we could do with juggling and that’s what got us interested. “It took me two full days of practicing before I did a three-ball cascade for the first time. It felt hard at first, but then I got the hang of it and it wasn’t hard anymore. The boys’ father, Alan Hodge, has been juggling since he was 16. Until he gave the video to Andrew as a birthday present, none of his sons had shown an interest in juggling. “Chris and Andrew got into juggling first, and then about six months later Danny picked it up,” Hodge said. “Our oldest son, Tim, also juggles, but Chris is the one who is most passionate about it. “I’m very surprised at how good they have gotten. Even Danny has surpassed me for the most part. I can do more things than he can, but his most difficult things are harder than my most difficult things. Daniel Eaker, 17, also toys with the idea of becoming a professional juggler one day. At the recent juggling festival he tied for first place in the numbers juggling competition by juggling nine balls for 25 catches. He also earned a silver medal for juggling eight rings for 16 catches, and a bronze medal for juggling six clubs for 12 catches. Every Wednesday, Daniel drives from Richmond to participate in the club’s weekly get-together in Venable Elementary School’s gym in Charlottesville. “That video made juggling look really cool,” Daniel said after working up a sweat juggling rings. “His routine was so well put together that it made me want to do it. “I found a bunch of different juggling stuff on the Internet. I think the reason why I love juggling so much is that there is so much to it. Daniel said he has learned a lot from other members of the club. One of his mentors is Nizer, who teaches that juggling alone isn’t enough. He believes in order to have a viable professional act, one must mix comedy with juggling and also interact with the audience. “Mark is a great juggler and performer who is a real inspiration to me,” Daniel said. “He is a great guy to be around, and he has given me a lot of performance tips. “Sometimes when people see juggling they don’t take it seriously. They think it’s a party trick or something that clowns do. “What I would like people to understand is that it really is an art and a sport. When you’re first learning, it definitely takes a lot of concentration. After you’ve been juggling for a while, it becomes a rhythm and a feel. Pat Hunter, who now lives in Atlanta, is credited for founding the local juggling club in the late 1980s. One of the first members he recruited was Aer Stephen, who is still active in the club. “Pat got a bunch of us math geeks from the University of Virginia together to form the club,” Stephen said. “Math people tend to have brains that like juggling. Tom Hamill, an aerospace engineer with Northrop Grumman, drives down from his home in Bealeton every week to attend meetings. He said the three-hour roundtrip drive is well worth it because of the high-quality jugglers in the club. “Juggling is an activity that endlessly challenges you without putting pressure on you,” said Hamill, who conquered the three-ball cascade in September 1983 when he was a freshman at Syracuse University. “There’s always new tricks to learn. A lot of times you may think you have reached the end as far as what you can do. People have been known to juggle everything from running chainsaws to bowling balls. Hamill started with softballs, but suggests a cheap alternative for beginners. “Get three tennis balls and cut a small slit in each of them,” Hamill said. “Then put a dozen or so pennies in each one, and that will give you a decent weight. “The main key is to start out slowly. Most people, even experienced jugglers trying to learn a new trick, tend to try to go too fast. “It just takes persistence to get over that first hurdle, which is learning the three-ball cascade. The tendency is to get frustrated, throw the balls on the ground and walk away. The Air Raid Juggling Club meets from 6 to 8:30 p.m. Wednesday in Venable Elementary School’s gym at 406 14th St. NW. Our very own Daniel Eaker, Chris Hodge and Andrew Hodge were among the winners. Daniel won Gold in the Individual Balls Numbers Championship, Silver in the Individual Rings Numbers Championship and Bronze in the Individual Clubs Numbers Championship. 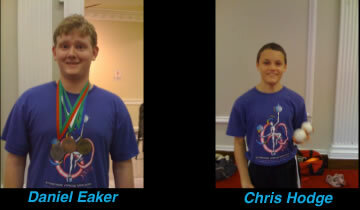 Chris and Andrew Hodge won Silver in the Ball Passing Numbers Championship. Also Chris Hodge won the Extreme Juggling title for both the 4 ball and 5 ball competition. Glad to see that the Air Raid club has attracted such great talent! It's getting near the end of a long and drawn-out summer, and perhaps you are looking for something new and very different to learn. 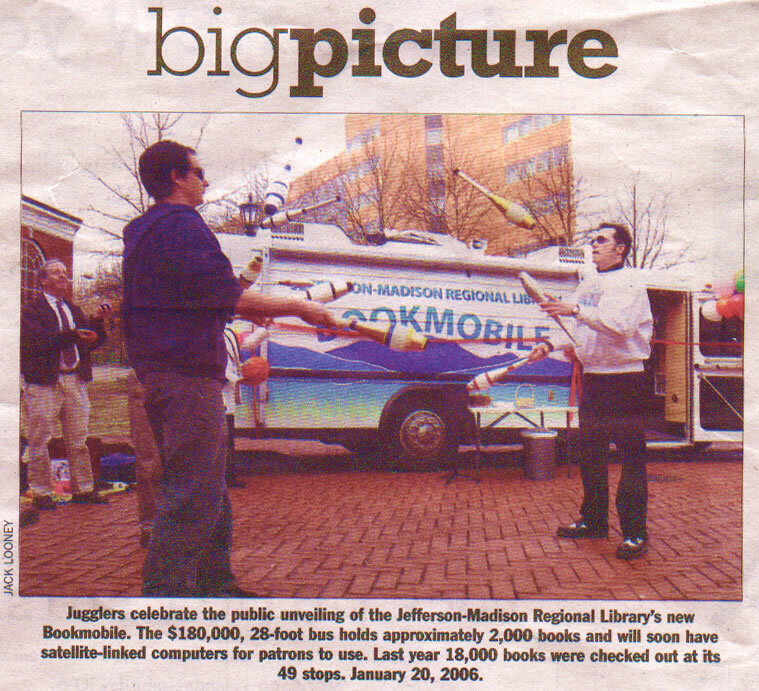 Every Wednesday at 6 p.m., go to the McIntire Room on the third floor of the Jefferson Madison Regional Library on Market Street to watch or learn from members of the AirRaid Juggling Club. 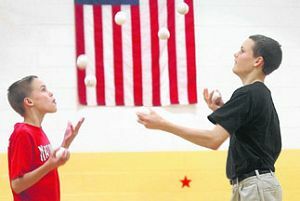 "If you have tricks you want to practice, you can do that, or pass tricks along to other people," said Tom Hamill, an AirRaid Juggling Club member. At the meetings, members also practice club passing - exchanging objects with other people, something a juggler can't do when practicing solo. Hamill, who lives in Bealton but regularly attends the Charlottesville meetings, said anyone is welcome to come. The numbers vary, but there are often between eight and 15 people who show up for a meeting. Hamill started juggling when he was in college in the 1980s, and has been doing it for 22 years. He joined the local club more than a year ago, as it's the closest one to his home. There are three juggling clubs in the Washington and Baltimore area. Typically there are clubs in the major metropolitan areas. There is no cost involved and people can just walk in "off the street." "People walk in and we spend time teaching them. Sometimes you never see them again. Others, they return," Hamill said. They use a variety of props, Hamill said, including juggling balls, which are like bean-bag balls but rounder, as well as juggling clubs and rings. People often refer to juggling clubs as bowling pins because of their shape, but they were specifically designed for juggling. In the meetings, members are able to practice throwing clubs to partners across from them. Other members might practice balancing balls or throwing other objects including diabloes, which are essentially Chinese yo-yos, Hamill explained. Still others may use a devil stick or cigar boxes, which W.C. Fields was known for juggling. Some might do hat juggling while others might use shaker cups. "People come up with different ways to manipulate a whole range of objects," Hamill said. "For example, somebody might do tennis balls and the can. The main reason the club exists is to take people who have some interest and to exchange tricks and learn new ones." 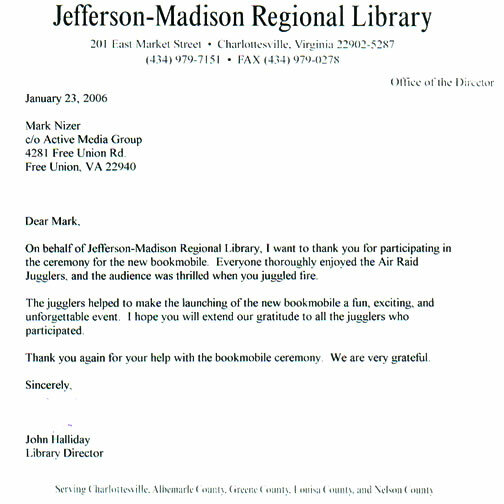 Hamill said the AirRaid Juggling Club also goes out and finds people who have never been exposed to juggling. They like to teach others how to do it. "Most people [in it] like the challenge," Hamill said. "It's a personal challenge to accomplish the tricks." The club has been asked to do demonstrations for other groups. Recently, they attended an elementary school carnival to show the children and parents how to juggle. They also took part in the Free Union July 4 parade. "This helps us let people know we exist," Hamill said. While the club doesn't have a Web site, there are other sites about juggling online. As far as the name goes, Mark Neisser, also a member, said the name came from a former president, Pat Hunter, who now lives in Atlanta. He started the organization about 10 years ago. Neisser points out that juggling is an inexpensive family activity, and anyone is welcome to get involved. Both members rejected the notion that there are those of us who wouldn't be able to learn or don't have the coordination to juggle. "It's absolutely for everyone," Neisser said. "I teach juggling and it's been my experience that people who say they can't do it learn the fastest." Neisser said one thing members need is a bigger space because the club is growing. E-mail Anne Causey at apc7f@virginia.edu.